MUNICH -- Robert Bosch GmbH posted its first annual loss since 1945 and said it would have to struggle to break even this year, as the global economic crisis hit the world's largest auto parts supplier. "There has been no business year since 1945 in which we had to take such significant hits regarding sales and results as was the case in 2009," Bosch CEO Franz Fehrenbach said in comments released Wednesday. He added that 2010 would not be an easy year for the company and that Bosch would have to struggle to break even. Sales in 2009 fell by about 16 percent to 38 billion euros ($53.4 billion), while the company's pretax loss is expected to have come to between 1.14 billion and 1.52 billion euros, he said. Fehrenbach said that the company aims to return to a pretax margin target of 7 percent to 8 percent in 2012 or 2013 and added that he saw global car production growing at a rate 10 percent to 15 percent this year. In 2009, sales at Bosch's automotive division fell 18 percent to 21.7 billion euros. The company says business has improved since the middle of 2009 and it expects the division to boost sales by 10 percent this year. 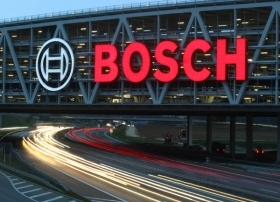 But to reach sales levels seen in 2007, the division must grow by at least 30 percent, Bosch said, adding that the company aims to reach its pre-recession sales level again in 2012. Bosch ranks No. 1 on the Automotive News Europe list of the top 100 global suppliers, with sales to automakers of $33.9 billion in 2008.